It wasn’t one of Michigan’s best performances of the year but it was definitely one of their gutsiest. After losing a seemingly endless number of close games this year, Michigan finally managed to pull one out. Michigan came out with their guns blazing in the first half. They hit 7 of their first 9 three point shots and scored with ease for most of the first stanza. But like we have seen all too often this year, they took their foot off the gas in the final five minutes. Iowa finished the half on a 14-4 run and the game was tied at halftime. The second half saw both teams take leads and battle back and forth. Michigan shot only 37% in the second half to Iowa’s 50% and the Hawkeyes appeared to have the game in hand in the final minute until DeShawn Sims took over. Sims scored all nine of Michigan’s points in the final 1:09 of the second half. Most importantly, he hit the game tying three with 7 seconds left over the outstretched arms of Aaron Fuller. Peedi missed plenty of easy shots throughout the night but he made just enough of them when it counted to make us forget about the misses. It appeared that Sims might have been fouled on that final three point attempt. According to Sims, an official told him that “he would have called the foul if it missed.” Big Ten officiating ladies and gentlemen. Considering both teams scored 33 points in each half. It’s not surprising that the four factors point to a dead heat. Both teams had the same effective field goal percentage, 55%. They both made 12 of 16 free throws. They both had 13 offensive rebounds for 12 second chance points. 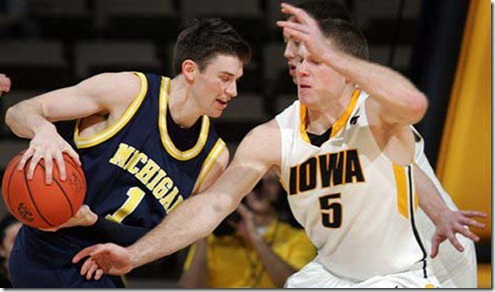 Iowa had 23 defensive rebounds to Michigan’s 22. The lone difference was that Michigan won the turnover battle ever so slightly (18% to 13.6%). Offensively, Michigan was hitting the three point shot. After shooting exactly 50% from three point range versus Minnesota, it was the second consecutive game Michigan shot 50% or higher. However it was the first time Michigan shot over 50% from three point range in the Beilein era (despite having shot exactly 50% on four different occasions). Despite their three point prowess, Michigan was dreadful inside the arc and made only 13 of 35 (37.1%) two point field goal attempts. Sims and Harris were the only ones taking two point shots. The duo shot 33 of Michigan’s 35 two point field goal attempts and accounted for 12 of Michigan’s 13 made two point field goals. Iowa does a surprisingly good job of defending the two point shot given their lack of size (opponents shoot 49% on 2fga, 122nd nationally). They do a good job of getting underneath driving opponents ever so slightly while they are going up, forcing them into an uncomfortable attempt. Michigan didn’t bring their A-game on the defensive side of the ball. Aaron Fuller simply killed Michigan, scoring 30 points on an extremely efficient 11 of 13 shooting to go with 13 rebounds. Fuller scored every which way inside the arc and Zack Novak simply couldn’t stop him. You can’t say I didn’t warn you. Conference road wins are always enjoyable even if this one is a little bittersweet given the way the season has gone. Michigan has two more winnable games coming up, hosting Penn State and Illinois. It’s obvious that despite numerous disappointing results, this team hasn’t folded. DeShawn Sims: 27 points on 10 of 25 shooting (9 of 23 from 2-point range) with 10 rebounds. Sims probably should have had 40 points if he made a higher percentage of layups. That being said, his three point shot at the end of the half was money and it’s tough to knock a guy who scores 27 points. Manny Harris: 20 points on 7 of 17 (4-7 3pt) shooting, 10 rebounds, 7 assists, 2 steals, 6 turnovers. A lot of good and a lot of bad. This is the Manny Harris we know. I think that, tonight, Harris’ great plays outweighed his bad ones. He hit some huge threes of the “no, no, no, YES!” variety that were reminiscent of last year’s Purdue and Minnesota games. Iowa did a great job of forcing Harris (3-10 on 2pt shots) into tough shots when he drove the lane but he did a good job distributing the ball and finding open shooters. Zack Novak: 9 points on 3 of 5 (all 3pt) shooting with 4 rebounds, 5 assists, 1 steal, and 0 turnovers. This is the type of “Novak stat line” that we haven’t seen in some time on the offensive end. I thought Novak looked well rested after some extended time off. He seemed to get more lift on his shot and it paid dividends. Novak’s defensive effort left something to be desired though, Aaron Fuller schooled him. Stu Douglass: Stu hit 3 out of 6 triples but he had 0 assists and 2 turnovers in 42 minutes. For a guy who was playing point guards for much of the game, that’s a scary statistic. Laval Lucas-Perry: In a way that only Laval Lucas-Perry can do, he hit three consecutive Michigan three pointers in the first half. The scoring outburst came from nowhere, Laval hadn’t scored in double digits since the January game at Penn State. Laval also stepped up at the free throw line down the stretch, making 4 out of 4. Darius Morris: Darius’ freshman season has been sort of like parents giving a teenager keys to the car. At first they give him the keys occasionally as he builds trust. Then they give him the keys permanently and he promptly gets in trouble again. Darius has games (like Minnesota) where he looks like the guy, then he has games like this one where his confidence is MIA and he is painful to watch. Zack Gibson: Gibson had a strong post move and finish early in the first half and also had three blocks but he still doesn’t block out. Michigan actually played Gibson with Sims for stretches and I haven’t looked through the play-by-play but there are clearly offensive limitations with this lineup. Anthony Wright: DNP-CD. It sounds like this was due to some sort of minor head injury but it doesn’t seem like a problem going forward.